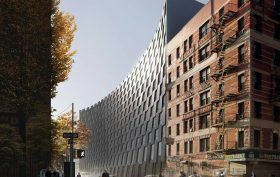 When 6sqft first got a look at Bjarke Ingels’ curved East Harlem rental, it sported a red corten steel facade reminiscent of the surrounding brick buildings, but a new set of renderings shows a blackened stainless steel exterior that the Danish starchitect told Curbed is “inspired by an elephant’s skin” and will capture and reflect sunlight. 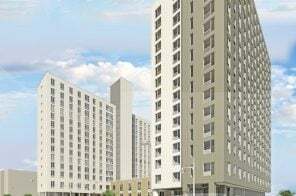 Now dubbed Gotham East 126th Residential, the 11-story structure from Blumenfeld Development Group broke ground yesterday, beginning its journey to offer 233 studio, one- and two-bedroom apartments, 46 of which will be affordable. Now that the hoopla surrounding his design for Two World Trade Center has simmered down, we’ve got a fresh set of renderings from Danish starchitect Bjarke Ingels. 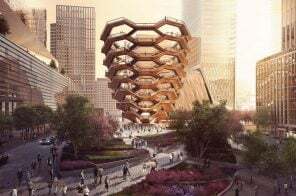 NY Yimby revealed the preliminary designs for his firm’s 11-story East Harlem apartment building at 146 East 126th Street, which show a T-shaped structure that cantilevers over the Gotham Plaza retail center on 125th Street. 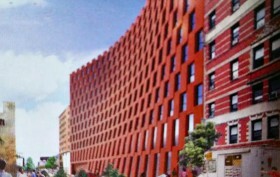 The real fun is on the 126th Street side, though, where Bjarke employs a play on the conventional street wall with an undulating facade that seems to be a modern interpretation of the surrounding brick buildings. 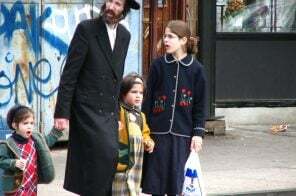 The project is being developed by none other than Extell, along with the Blumenfeld Group.